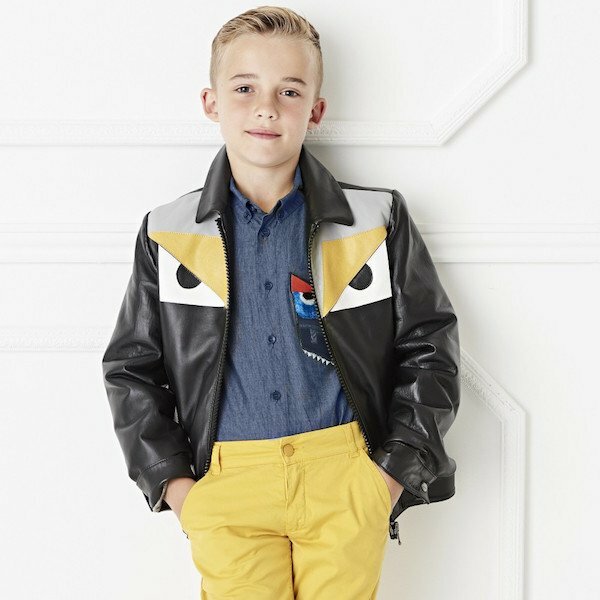 Now this is a beautiful soft, black leather jacket by Fendi Boy, featuring the designer's monster 'Bag Bug' eyes in yellow, white and grey. This luxurious biker style jacket is fully lined in silky viscose printed with the Fendi logo and has lightweight padding. Complete the look with this FENDI Boys Blue Cotton Chambray 'Monster' Shirt with the famous yellow eyes and white teeth and a pair of stylish yellow pants. Don't forget these matching FENDI Black Leather 'Monster' Zip-Up Boots and Grey Cotton 'Monster Robot' Socks.